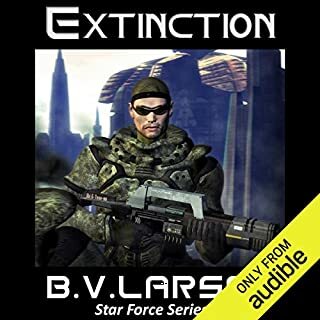 In the fifth book of the Undying Mercenaries series, the war comes home, and aliens strike a devastating blow. 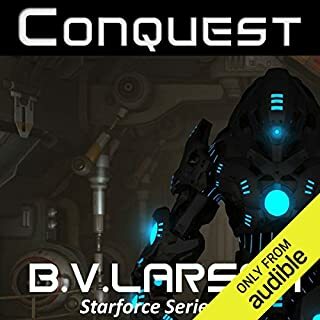 Bent on revenge, Legion Varus chases the raiders to the stars and discovers a growing alien menace. A cancerous species has invaded our region of the galaxy and must be dealt with. McGill learns why the Cephalopod Kingdom has yet to attack Earth and what's happening behind the scenes in the Core Worlds. Throughout, he upholds his unique sense of right, wrong, and honor. 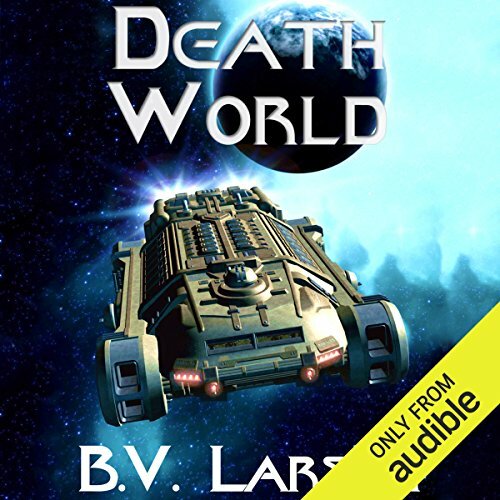 Death World is a military science fiction novel by best-selling author B. V. Larson. 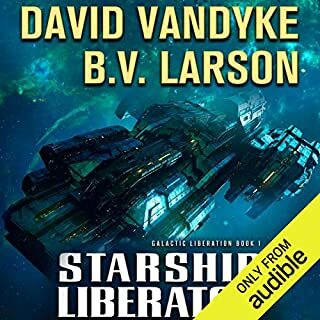 I have Listened to many B. V. Larson books and they do not tend to dissapoint. 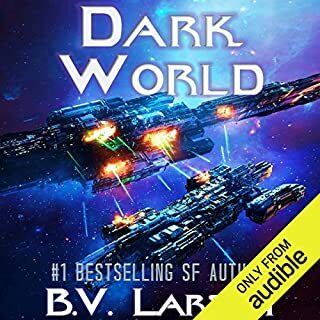 Death World is no exception and with my favourite narrator Mark Boyett at the helm, you simply cannot go wrong. 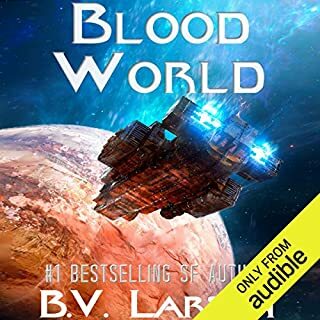 Death World is a real adventure, it will keep you hooked right to the end. 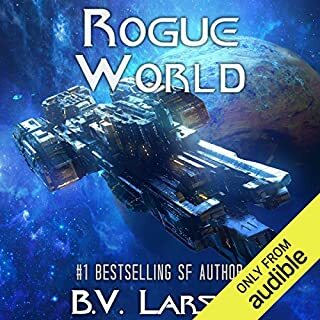 The characters and the world they are in are brought to life with Larson's talent for knowing what his readers/listeners need to know and what they do not, you quickly become immersed in the emotions, actions, choices, life experiences and current situational reality of the characters. 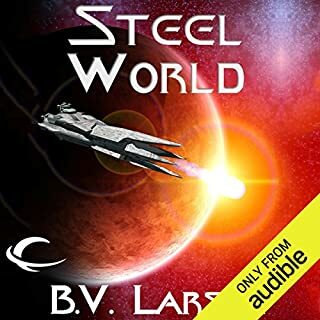 Yes, this is another Sci Fi story, it is however executed far better than many others. 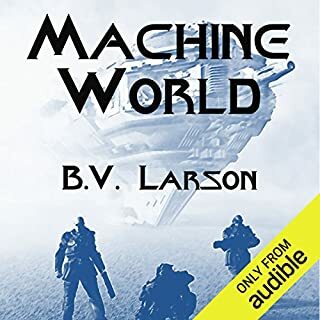 B. V, Larson has written a staggering number of books and I have enoyed about a dozen of them, its really quite imprressive how Larson keeps the quality and passion so high in so many books, but he does and he should be applauded for his consistent high quality of story writing. 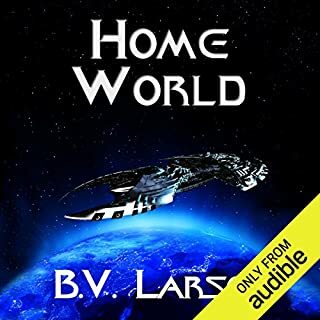 The characters and world they are in are brought to life with Larson's talent for knowing what his readers/listeners need to know and what they do not, you quickly become involved in the emotions, actions, choices, life experiences and current situational reality of the characters. 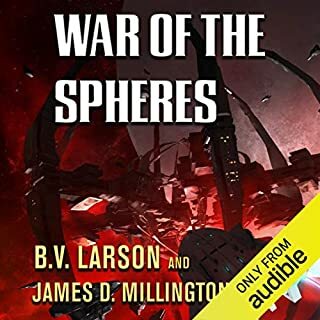 With the combination of Larson's talent, understanding of the human condition both in reality and in fiction, passion and endless fountain of detailed and creative ideas, coupled with the perfect narrator choice every time, these books are a must! 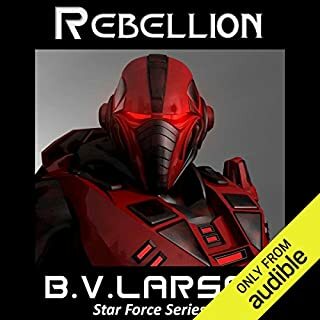 After a devastating attack on Earth newly appointed Veteran James McGill and Legion Varus chase after the culprits responsible. It leads them to an uncharted planet located in Earth’s part of the galaxy that is infested with a previously unknown hostile alien species that even the Cephalopods are afraid of; but this new species is nothing that some weed killer couldn’t put down, as they are plants. This book is called “Death World,” and the reason for the name is explained in the content of the story but for those following “The Undying Mercenaries,” we know that death is a common occurrence for James McGill and Legion Varus and even a “Perm” death seems most unlikely following the plot. 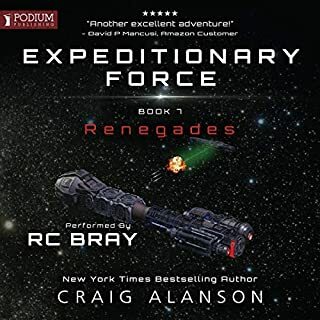 Title aside what makes this story, and all of “The Undying Mercenaries” books, interesting are the behind the scenes scheming and James McGill steadfast determination to do the right thing which usually disrupts those schemes and saves the day. 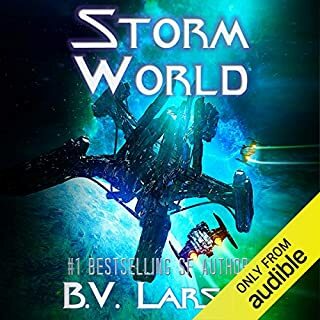 There are several twists and turns along the story line and a really liked the last chapter setting up the next book in the series. 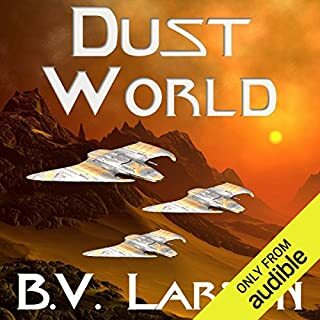 The narrator, Mark Boyett, did another fantastic job. The first two books of this series were semi-painful because of McGill's righteous attitude. Now the story has progressed and operates more in a gray area, it is a sign of great character development that I wasn't expecting. It has been an extreme pleasure to listen to James McGill grow up with the Undying Mercenaries. This series has captured my imagination unlike any before it in the sci-fi realm. Maybe it's because the author writes like I would write and he anticipates plot twists like I would as well. In Death World the whole gang is back and better than ever. We even get to know McGill's parents a little bit. This is probably the most complete novel of the series in my opinion. After Tech World I was almost ready to declare this series had run its course. 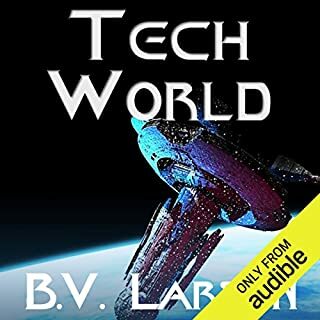 I thought maybe the author should wrap this up because in Tech World I felt like the aliens were secondary to the story with Claver. But now with death world Claver is front and center of the story wouldn't be the same without him. I love how the story ended as well. Finally James got some recognition. And they were plenty of teases about the new adventures coming in the next book Throne World. I can't wait. McGill, Turov, Claver, Natasha, Carlos, Graves, Keevee, Della—reckless, narcissistic, conniving, sneaky, irritating, steadfast, petulant, and feral by turns—they are all back in Death World. 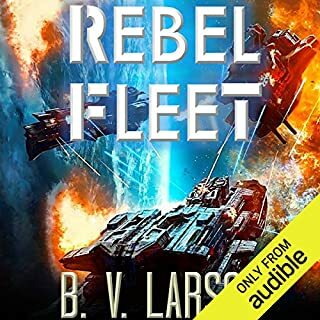 Larson has created a cast of great characters, all closely intertwined with our hero James Mcgill, and this allows him to put those people in interesting situations. This is the strong suit of the series, his people are great and the conflicts in which he inserts them become interesting because they themselves are interesting. McGill’s misadventures are driven by his lack of personal restraint and personal sense of honor. McGill is a wonderful character with a fascinating approach to life, navigating through every circumstance as a loose cannon, willing to live with the consequences of his decisions, and repeatedly being vindicated for his insubordinate acts. In one hilarious scene, one of his superiors asks him for advice in how to get away with disobeying a direct order. This is great entertainment. Don’t miss it. I certainly won’t miss the next installment of the misadventures of James McGill. Mark Boyett is amazing here and his portrayal of female voices with his deep male vocal cords is always convincing. I took a break from this series after book 3. It was exciting and very but just a little over the top. Death World really nailed all aspects... Very strong as a character driven story - especially McGill as the focus - but so too are all the key characters who are fully fleshed out. Their actions comprehensible even if strange or unintuitive. The story stretches the imagination without stretching the credibility of the characters. For a fun vivid yarn you actually care about. This is a terrific fun combo for adventure. Roman military features, good tech, A dystopian universe of multi species politics. And a group of corrupt power grasping misanthropes and one clever but not calculating Southern rogue. 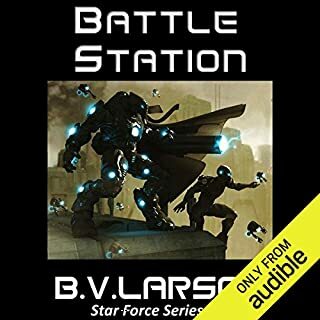 I can't help but admire the well developed character in this series of books by the author B.V. Larson. This installment was as attention getting and thrilling as every one before it. I may be a sucker for the underdogs in these battles, but I'm human and live the idea that we can and do win in the end. Great book and series not to mention a great performance by Mr Boyett. You gotta love him, our boy James. He still has his wits and his humor. But now with a kid and a baby-mama, his thoughts do turn introspective and a little deep. His parents get a chance to be shown in greater depth, and we can see a bit of where McGill comes from. Another great book in the series. You might think that with all the dying and reviving, life and death would not mean much and you would get tired of the concept. But it doesn't; there are believable attitudes towards it all. There are tons of twists and complications, and officers scrapping to get or remain on top, while the mostly honorable grunts below do the heavy work and the dying. There's humor and pathos and contemplation. This time the aliens are hive-minded plants, and they are very, very clever. Larson's science is well thought-out; his personalities are realistic and well-rounded. This is great stuff on many levels. Mark Boyett's narration is wonderful. I love the voices he gives the characters. 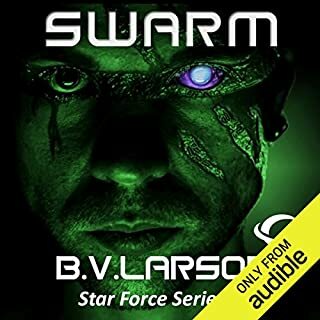 If you love space and aliens and soldiers, and outwitting aliens, slippery, conniving bad guys who sometimes do good, and working your way around rules and orders, then you must meet Larson. If you have started this series, then keep on going. I can't wait for the next one. I don't feel like the story went anywhere with this. We learn a bit more, there are more instances of being clever without meaning to but overall not all that great.